Join us in celebrating over 30 years! 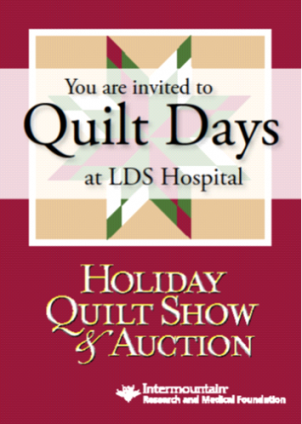 The Holiday Quilt Show & Auction has raised funds for medical research since 1983. For more than 30 years, Intermountain Research and Medical Foundation's Holiday Quilt Show & Auction has been an important source of funding to further Intermountain Healthcare’s mission of helping people live the healthiest lives possible. or by calling Intermountain Research and Medical Foundation. All funds raised from these events will directly support the Behavioral Health Program at LDS Hospital. Funds will be used to ensure practitioners have access to cutting-edge interventions that will allow them to provide the best care to patients and families with behavioral health concerns. 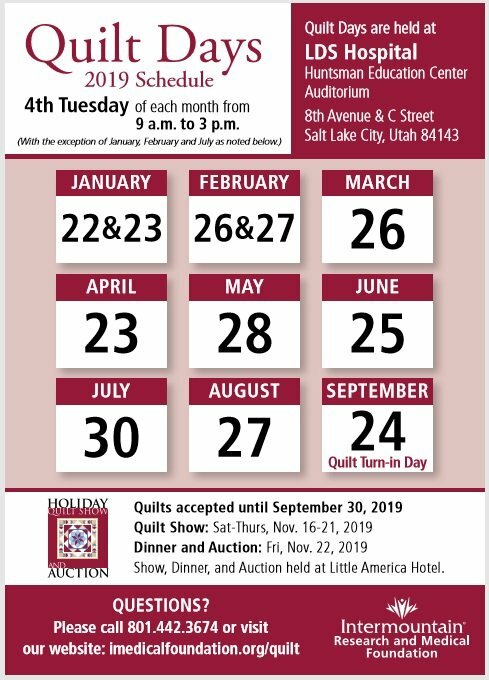 From its humble beginnings in 1983 as several women who valued the rich cultural heritage of quilt making organized the first Quilt Show, today, the Holiday Quilt Show & Auction is one of the last remaining all-hand-quilted quilt shows in the United States. Each year hundreds of volunteers give countless hours of their time, talents, and resources to create beautiful handmade quilts. Thanks to a generous community, more than $2.5 million dollars has been raised through the Quilt Show furthering Intermountain Research and Medical Foundation's mission of funding medical research and education, which advances the science of medicine, and providing the highest quality healthcare to the Salt Lake Valley.